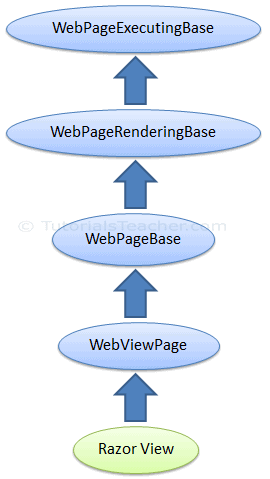 Every view in ASP.NET MVC is derived from WebViewPage. The following figure shows class hierarchy. So, you can use any of the method and properties of WebViewPage and its' base class such as WebPageBase, WebPageRenderingBase & WebPageExecutingBase starting with @symbol. WebViewPage class includes following members. Ajax Gets or sets theÂ AjaxHelperÂ object that is used to render HTML using Ajax. Html Gets or sets theÂ HtmlHelperÂ object that is used to render HTML elements. Model Gets theÂ ModelÂ property of the associatedÂ ViewDataDictionaryÂ object. ViewBag Gets the view bag. ViewContext Gets or sets the information that is used to render the view. ViewData Gets or sets a dictionary that contains data to pass between the controller and the view. Visit MSDN for detailed information on WebViewPage members. Thus, when you use HtmlHelper class using @Html, you actually use HtmlHelper class assigned to Html property of WebViewPage.